Rush made his debut for Auckland and the Blues in 1997 and progressed to All Black honours a year later, although somewhat prematurely. As a 21-year-old he was drafted in at No.8 in an injury-ravaged selection to face Australia in Sydney and after a difficult bow he drifted from the international scene until 2004, when he won seven further caps. At domestic level he became a reliable, powerful ball-carrier and an inspirational skipper, leading Auckland to the 2002 NPC and the Blues to the 2003 Super 12 title. In 2005 Rush left for Cardiff Blues and became a cult hero in Wales, where his form hit a massive high. In 2010 Rush confirmed his intention to leave the Blues for Ulster, eventually opting to stay in Cardiff after starring in their march to the European Challenge Cup title. 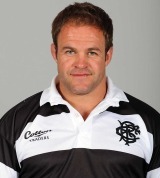 Also in 2010 he captained the Barbarians to victory over Ireland, scoring a try.